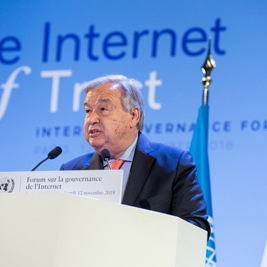 The 13th Internet Governance Forum (IGF) concluded on 14 November in Paris, highlighting the importance of the rule of law and global cooperation to ensure a safe cyberspace. More than 3,000 participants, including high-level government officials, civil society leaders, private sector and internet policy experts from 143 countries, attended the three-day Forum. Under the title ‘Internet of Trust’, the Forum facilitated discussions on how to promote positive impacts of new technologies and how they can realize their full social and economic potential while also looking at curbing the more insidious uses of the Internet. This annual Forum maximizes the opportunity for open and inclusive dialogue and the exchange of ideas on Internet governance (IG) related issues; creates opportunities to share best practices and experiences; identifies emerging issues and bring them to the attention of the relevant bodies and the public; and contributes to capacity building for Internet governance.